AGL, which is supported by the Linux Foundation and boasts a membership roll of more than 100 of the biggest players in the auto and tech industries, aims to provide carmakers with a pliable base to develop new software for their connected cars and unify the various dashboard systems into one industry standard. 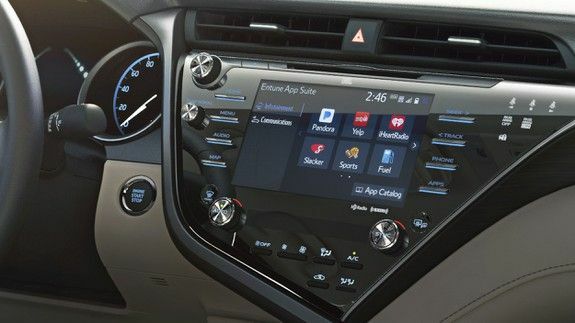 The open source platform means that even more apps and connected features could be available from developers who have access to its SDK, which could even bring Android Auto and Apple CarPlay directly into the Camry’s dash. The programs are available with AGL, but Toyota hasn’t clarified if they’ll be included in its App Suite Connect management system. Toyota’s Camry gives the AGL platform a home in one of America’s best-selling cars, while the increased functionality of an open source platform will allow the automaker to speed up the release of the new infotainment features across its lineup. Keiji Yamamoto, Executive Vice President, Connected Company of Toyota Motor Corporation, praised AGL’s “flexibility,” in a release announcing the news. Toyota’s AGL-enabled cars will help develop the system even further. According to the release, the automaker will continue to contribute code to the AGL platform as the 2018 Camrys with the new infotainment system hit the streets. Most upcoming vehicles from Toyota, including those from the luxe Lexus brand, will offer the new platform too by the end of the summer, strengthening the open source ecosystem within the North American market. While AGL attempts to unify the connected car ecosystem through infotainment centers, other players are looking to take their own piece of the market, most notably Google. The search giant partnered with Audi and Volvo to introduce an Android-powered connected car system, which could offer developers an enticing platform for connected car development. The Android platform is projected to hit roads within the next two years. Recently our clients have reached out to us to find Linux Lead Developers in order to run innovative projects such as this one. What areas in your everyday life would you like to see Linux technology integrated? When will be the camry 2018 ready? I really like the new convertion they’re making its really nice interesting.